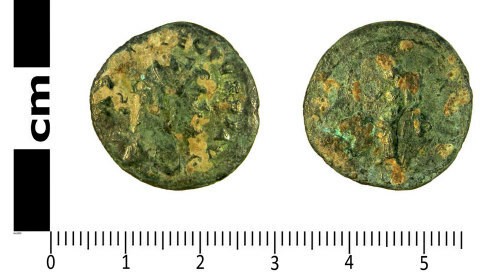 Copper alloy radiate of Allectus (AD 293-6) (Reece Period 14). C Mint. RIC V, pt 2, p. 566, no. 86. Obverse: IMP C ALLECTVS P F AVG. Radiate, draped and cuirassed bust right. Reverse: [PAX] AVG; Pax standing left with branch and vertical sceptre. Obverse description: Radiate, draped and cuirassed right M.m. : [S]/P//C.